Boro means tattered or rags. It is having a renaissance as a contemporary design element. Check out a discussion about this on https://youtu.be/BJOFQXujCD8, with Yoshiko Wada and Kim Schufftan, explaining this art form. It was a patchwork style, using sashiko stitching, to save articles of clothing, bedding, and bags to reuse parts and pieces from worn pieces of clothing to save others and make something else. What is considered beautiful today was one time shameful in Japan, because only the very poor did this. 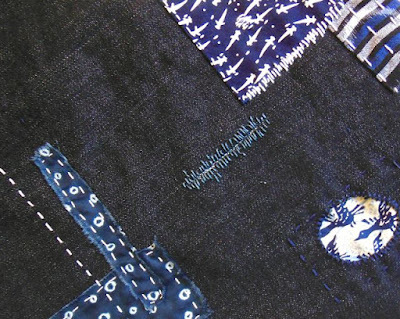 Most that we find today are from indigo dyed fabrics and denim. However, even silk garments are found in the Boro style. Today it has become popular, and if found, are very expensive. My Grandmother used to save things that she found beautiful, although maybe not useful any longer. She would say mottainai...sense of regret for being wasteful. This Japanese word was used in many ways but this is one I remember. 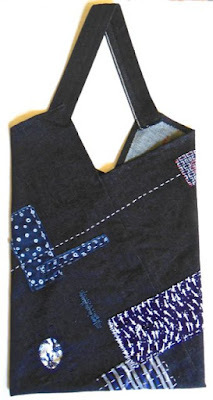 Modern designers are emulating the Boro style, as we did making these Boro Boro Bags with Jody. Jody studied the Tsuno Bukuro model (Horn Bag) and showed us how to make them, and all the types of stitching that were traditionally on Boro pieces. She provided us with a simple strip of cloth that we were to stitch as a sampler. (kimono pieces are traditionally 14" wide X 12 yards, so parts and pieces were used with this size in mind) My base piece was approximately a 13"X 36"strip. One side of my Boro Bag. The base is a soft denim. The opposite side of the bag. The patches are Japanese cotton prints. Close up of some of the patchwork stitches and sashiko stitches. There is a slash with a jaoining stitch and a patch hole stitch. All stitches are simple and no embroidery style stitches are used. 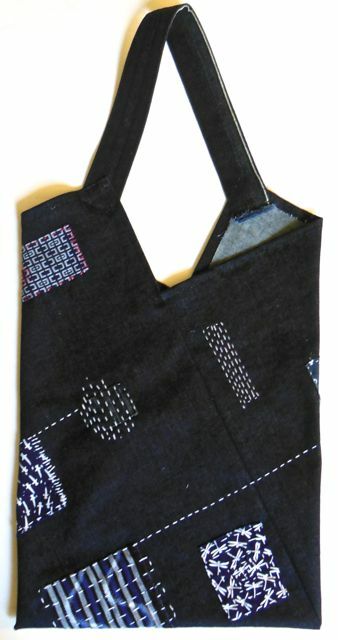 Labels: Bags, Boro, Japanese tradition, Jody Alexander, Sashiko. A Verb for Keeping Warm. Mottainai.